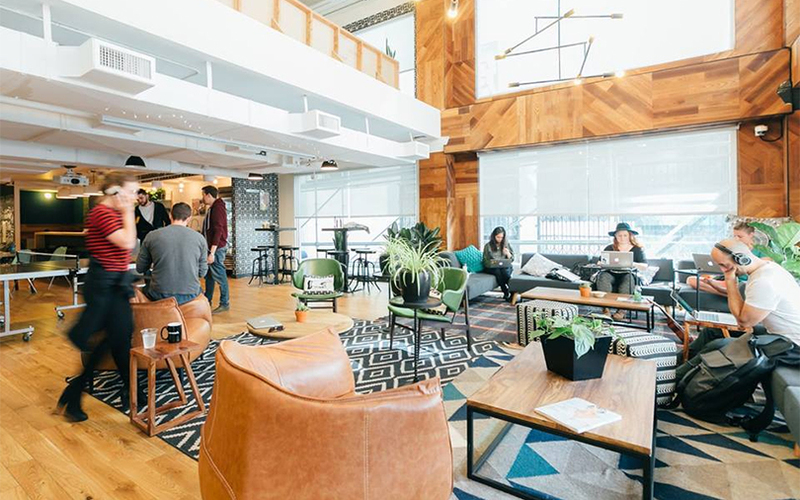 New York-based shared workspace provider WeWork has started operations in India with a 2,200-seater community workspace christened as ‘WeWork Galaxy’ at Residency Road in Bengaluru. The seven-year-old startup plans to open two more such centres—one each at Koramangala and Domlur—in Bengaluru. The Bengaluru launch coincides with the opening of its first centre in Sao Paulo, Brazil. WeWork India is headed by Karan Virwani, the scion of the Embassy Group, and is led by Juggy Marwaha, who was previously managing director - south India at Jones Lang LaSalle. “Nearly 70% of the 1,200 seats that are currently available are already occupied. We are working on opening the rest of the space in a few months,” Virwani said. When the complete building is ready, the facility will have 2,200 desk stations, a swimming pool and a gym. Like other managed workspaces, the facility takes care of basic amenities, including Internet, electricity, administrative tasks, and cleaning and maintenance. Apart from startups, WeWork offers its shared workspaces to large enterprises looking to set up micro-teams in such environments. Virwani said the company would keep a startup-enterprise ratio of 40:60 at the facility. “We wouldn’t want to be another IT park, which is very easy. We want to keep the startup ambiance and the feel of an entrepreneurial community where even multinational corporates can be present,” he said. Software major Microsoft has taken a 500-seat space at the Bengaluru facility. The workspace also houses Meghshala, an NGO that creates engaging lessons for students, uploads them to the cloud and has teachers invoke them in classrooms using tablets and handheld projectors. Founded in 2010 by Adam Neumann and Miguel McKelvey, the firm is now valued over $17 billion, making it the eighth most-valued startup in the world, according to The Wall Street Journal rankings. In India, the firm is building two more facilities in Mumbai and Delhi-NCR. It plans to establish a strong presence of 20-30 facilities in these cities before penetrating tier II cities. The concept of co-working seems to be thriving in India and the entry of WeWork will heat up the market, which currently has a dozen firms including Awfis, Innov8, 91Springboard, BHIVE, Numa, CoLife, InstaOffice and myHQ. In the most recent investment in the space, co-working startup BHIVE raised $1.2 million in a fresh funding round led by existing investor Blume Ventures. Other co-working startups that have received investor attention include Delhi-based Awfis, which offers shared working spaces. It recently raised $20 million in a Series B round of funding from Sequoia India. In April, The Office Pass, a co-working platform launched by Makaan co-founders, raised seed investment worth $245,000 (Rs 1.5 crore) from a group of individual investors led by Arun Tadanki, former managing director of Yahoo Southeast Asia and India. In February, Innov8 raised angel funding from Venture Catalysts and individual investors such as Paytm’s Vijay Shekhar Sharma, Google’s Rajan Anandan and others through the LetsVenture platform. In January, Gurgaon-based InstaOffice raised pre-Series A funding led by online venture capital platform Globevestor and other angel investors, including Toppr’s Zishaan Hayath.